When last year, at the G-20 summit in Pittsburgh, President Obama, former Prime Minister Gordon Brown and President Sarkozy made public a secret uranium enrichment site at Fordow near Qom in Iran, one week after the Iranians had informed the International Atomic Energy Agency (IAEA) about the construction site in a letter, the international shock was immense. Although former IAEA Director General Mohamed ElBaradei described the site later as just “a hole in the mountain” after a visit in October, suspicion grew that Iran may pursue the covert construction of possibly numerous sites in the country without informing the Agency, apparently in response to continuous threats of military actions from Israel and the United States. Tehran apparently even lost interest in the Fordow site after it had been revealed. In November, Ali Akbar Salehi, head of Iran’s Atomic Energy Agency, had announced that the country is investigation the suitability for uranium enrichment of ten further sites in Iran. Yesterday the National Council for the Resistance of Iran (NCRI), which is related to the Mujahedin-e Khalq (MKO, a terrorist organization according to the US, UK and Iran), and which has also revealed the existence of Iran’s first uranium enrichment facility at Natanz, has claimed that another secret enrichment site in Abyek near Qazvin, northwest of the capital Tehran, had been under construction for at least five years. 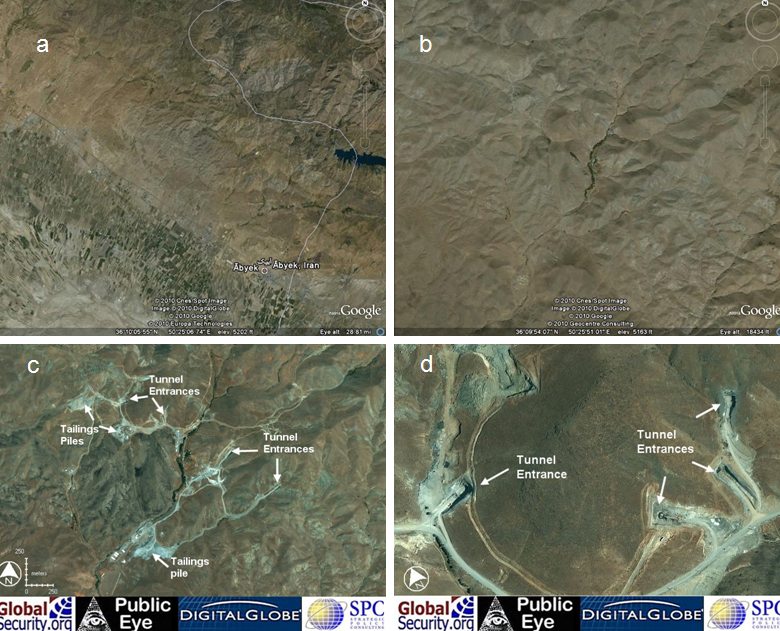 Satellite imagery of GoogleEarth (figures a and b, before 2004) and material of August 2010 provided by DigitalGlobe (figures c and d) indicate considerable activity with several tunnel entrances. In fact, at first sight, the new pictures resemble those of the Fordow site. David Albright of the non-governmental Institute for Science and International Security (ISIS) has questioned in the meantime the claim made by the NCRI. Of course, Salehi has denied the allegations, as well. As state owned Press TV reports, he mentions other activities, such as the construction of “plenty of facilities that, for example, sterilize agricultural products [by] using nuclear technology which do not fall into the nuclear plant category,” which might not be very convincing. The coming days will show whether the reported digging activities have any meaning with regard to Iran’s allegedly military/peaceful nuclear program. Last update September 11, 2010. This entry was posted in IAEA, Iran and tagged Abyek, MKO, National Council for the Resistance of Iran, NCRI, NPT, Qazvin, Qom, uranium enrichment. Bookmark the permalink.